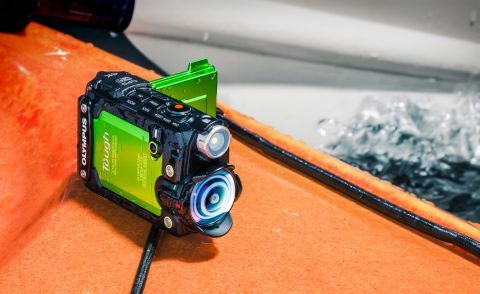 The TG-Tracker is Olympus's first venture into the action camera market, and its camcorder-like design stands in stark contrast to the usual box design favoured by market leaders GoPro and the majority of other action camera makers. Olympus is by no means new to rugged cameras, however, with an existing range of 'Tough' compacts. These are fully waterproof and shockproof, so it's no surprise that the small TG-Tracker shares similar design traits, the Tough branding and a bright green colour option in addition to black. The Olympus TG-Tracker stands out visually, and follows the styling of the company's Tough compact camera range. I tested the striking green version, but a black version is also available. At 35 x 56 x 93mm it's relatively small, and weighs in at 180g, a little heavier than the 152g GoPro Hero4 Black. On the left side of the camera is the flip-out 3.8-inch screen. This extra weight can cause a bit of additional wobble and vibration when the camera is mounted on bike handlebars or similar. Helpfully the built-in image stabilizer can be enabled via the menu system, and does a good job of reducing, although not totally eliminating, vibrations. A small LED lamp can be used for illumination when filming in the dark, a feature not seen on an action camera before. Unlike the GoPro Hero4 Black, which requires a separate waterproof housing, the TG-Tracker (like the Virb XE and Bandit) is waterproof out of the box to 30m. All the TG-Tracker's buttons and ports are fully sealed, with access to the battery, microSD slot, and USB and HDMI ports via a lockable hinged door on the back of the camera. As with the rest of Olympus's Tough range the camera has been built to withstand abuse. In addition to being waterproof it can operate in temperatures down to -10, survive being dropped from up to 2.1m, and is crush-proof up to 100kg – so you don't have to worry about accidentally sitting on it. The small camera packs headline features including built-in Wi-Fi, GPS, motion sensors and 4K video capability. It looks like Olympus is serious about making an impact in a market that has recently seen a slowdown in innovation. The TG-Tracker features five field sensors: GPS, compass, acceleration sensor, barometer and thermometer. These make it a serious rival to the Garmin Virb XE and TomTom Bandit, both of which are equipped with motion sensors and GPS, and are available at a similar price. Inside the TG-Tracker is a 7.2 million pixel, 1/2.3-inch CMOS sensor, which is fronted by an ultra-wide – even in action camera terms – 204-degree angle of view lens. In addition to 4K at 30fps it's possible to record at other resolutions, including 1080p and 720p at 60fps and 30fps. There's also a high-speed recording option, which enables frame rates at 720p and 480p to be increased to 240fps, which will enable slow motion playback once edited. Stills can also be captured at 8 million pixels, and all footage is captured on a microSD card that slots into the back of the camera. The TG-Tracker will appeal to those involved with distance and speed sports, such as skiers, mountain bikers and orienteers, and also to families, with the compact camcorder-like design, flip-out screen, direct-access menus and intuitive controls making it easy to use.